Green Bean Casserole FROM SCRATCH! A remake of the classic Thanksgiving side dish made with fresh green beans and no canned ingredients. For the Topping: Pulse bread, butter, salt and pepper in food processor until mixture resembles coarse crumbs, about ten 1-second pulses. Transfer to a large bowl and toss with onions; set aside. For the Beans and Sauce: Adjust oven rack to middle position and heat oven to 425 degrees F. Fill a large bowl with ice water. Bring 4 quarts of water to a boil in a large pot or Dutch oven. Add 2 tablespoons salt and beans. Cook beans until bright green and crisp-tender, about 6 minutes. Drain beans in colander and plunge immediately into ice water to stop cooking. Spread beans on paper towel-lined baking sheet to drain. Add butter to now-empty pot and melt over medium-high heat until foaming subsides. Add mushrooms, garlic, salt, and pepper; cook until mushrooms release moisture and liquid evaporates, about 6 minutes. Add flour and cook for 1 minute, stirring constantly. Stir in broth and bring to simmer, stirring constantly. Add cream, reduce heat to medium, and simmer until sauce is thickened and reduced to 3½ cups, about 12 minutes. Season with salt and pepper to taste. Add green beans to sauce and stir until evenly coated. Arrange in an even layer in 3-quart (or 9x13-inch) baking dish. Sprinkle with topping and bake until top is golden brown and sauce is bubbling around edges, about 15 minutes. Serve immediately. Leftovers can be stored in an airtight container in the refrigerator for up to 4 days. To Prepare Ahead of Time: Store the bread crumb topping in an airtight container in the refrigerator and combine with the onions just before cooking. Combine the beans and cooled sauce in a baking dish, cover with plastic wrap, and refrigerate for up to 24 hours. To serve, remove the plastic wrap and heat the casserole in a 425-degree oven for 10 minutes, then add the topping and bake as directed. To Halve the Recipe: This recipe can be halved and baked in a 2-quart (or 8-inch square) baking dish. If making a half batch, reduce the cooking time of the sauce in Step 3 to about 6 minutes (1¾ cups) and the baking time in Step 4 to 10 minutes. To Make Homemade Onions for Topping: If you want to go 100% homemade and eliminate the canned fried onions, you can make your own caramelized onions. Thinly slice 2 sweet onions and sauté in 2 tablespoons of unsalted butter over medium-high heat for about 10 minutes. Reduce heat to medium-low, sprinkle with salt and cook, stirring occasionally, for about 30 minutes, or until the onions are golden, caramelized and soft. Set aside to cool before combining with remainder of crumb topping. Proceed with the recipe as directed. 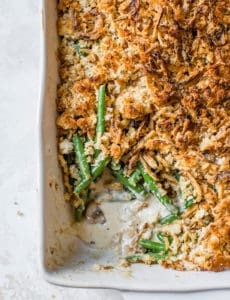 To Add Bacon and Cheese: To take this casserole up another notch, cook and crumble 8 ounces of bacon and stir it into the mushroom cream sauce along with the green beans. For a cheesy version, add 6 ounces of shredded cheese (choose a favorite - cheddar would be great, but you could use Monterey Jack, pepper jack, Swiss, gouda, or any combination!) to the mushroom cream sauce before stirring in the green beans; or you could add half of the cheese to the sauce and toss the other half with the topping.